Egg Cartons hold those precious, delicious eggs that we eat for breakfast, add to cakes, and serve deviled at parties. 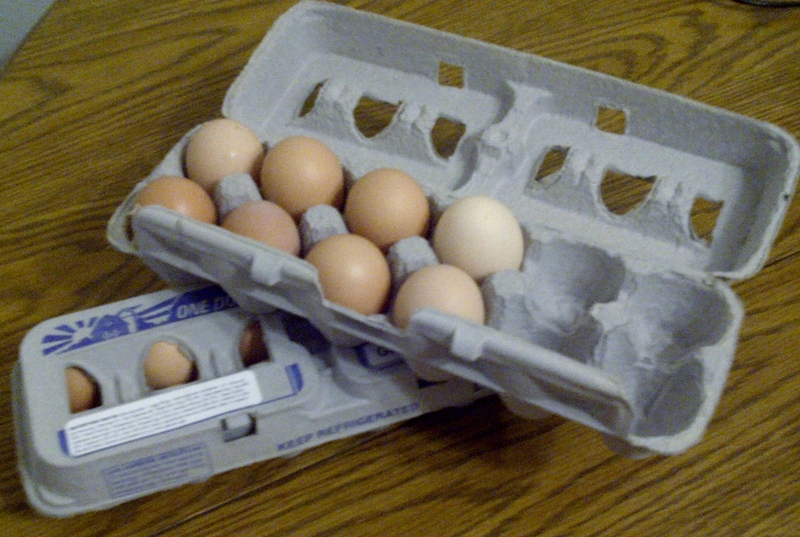 When the eggs are used, do your egg cartons end up in the garbage or recycle bin? Those nifty 12-holed cartons have more life than we think. Check out the following ideas that will give your egg cartons uses that are more practical. Wash foam cartons and use them for making ice-cubes. Fill each space with a fresh basil leaf and add water. Freeze. When a recipe calls for the fresh herb, just drop in a cube. Make homemade pesto with your garden ingredients. Fill the twelve spots with a tablespoon of pesto. Cut off the lid side of the carton; insert the bottom in a gallon size freezer bag, then freeze the pesto cubes. Now you can create your own sauces and dips with your homemade pesto. Fit carton into high boots to help keep the boots upright and in shape. With a foam carton, use the compartments for a kids painting project. Store jewelry (earrings work great) in each compartment. When building a project, keep your nails, screws, and other building do-dads in the compartments to avoid lost parts. Cut off the lid and use the bottom compartments to sort stuff in your junk drawer. Make your own campfire starter by filling each compartment of the carton with a bit of straw or newspaper, and cover with melted wax. When the wax hardens, use one of the compartments to start the fire. If you light the straw or newspaper and add it to your kindling, the wax will melt and keep the kindling burning long enough to add large logs. Use a foam or cardboard carton to start plants using seeds. Store small Christmas ornaments in the carton to keep them safe. The perfect snack size can be measured in 12 easy servings. Place M&M’s, nuts, dried fruit or any small snack in each compartment. Once filled you have the perfect snack size. Transfer to a plastic sandwich bag and now you can have a snack ready for when you are on the go. Kids will love gelatin rounds. Fill a foam egg container with gelatin that has been mixed according to directions. Refrigerate until set. Pop out of the carton. Great dessert for the kids! Do you have any egg carton uses or ideas that have not been listed? Please share your ideas with us. Posted in Helpful Hints on Everything and tagged cardboard carton, Egg Carton uses, egg cartons, fire starter, freezing herbs, Grandmother Musings, Helpful Hints On Everything, postaday, recycle, Reuse Egg Cartons, The Incredible Egg Carton. Bookmark the permalink. Great post! Reminds me of when my kids were small I would use an ice cube tray and put little snacks in the holes. A piece of cheese, a cracker, etc. Just using the ice cube tray made it interesting enuf for those fussy eaters to eat. I love re-purposing things. Great post! I’m going to tell my daughter-in-laws about using egg cartons for their boots! These are really great ideas, especially the ice cube one. I work full time packing eggs. I never thought of using cartons for other various ideas. I will have too keep this in mind when I have a few on hand. Thank you! When I was in college decades ago, I had a friend who used to fill the carton with soil and then grow marijuana plants in each space. He eventually got caught.